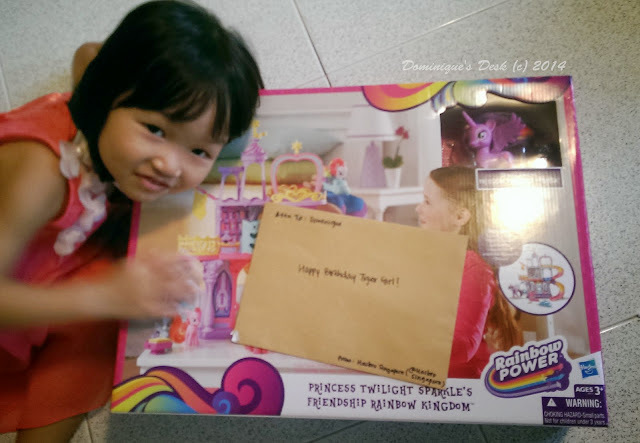 Tiger girl recently celebrated her 4th birthday with a bit of magic from My Little Pony . 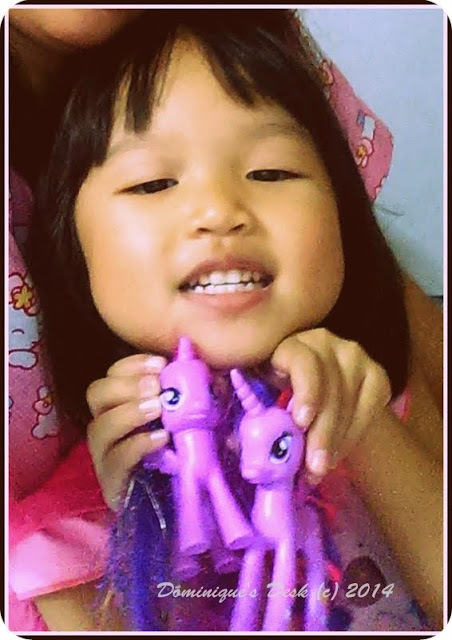 She has been obsessed with this particular line of product from Hasbro since she saw the My Little Pony cartoons on you tube. Her favourite of all the ponies is Princess Twilight Sparkles. She loves the little purple horse and has 3 versions of it. Twilight as foal, a filly and as a mare. She loves her beautiful mane with colorful highlights and can spend hours playing with them. Tiger girl was extremely surprised when she received the large parcel by courier while we were out for lunch and a movie. There was a personalize note addressed to her together with the present. The little girl was over the moon with her new toy set and couldn’t wait to open it up. It took a lot of tolerance on her part to wait till we got home after the movie to open up the playset. Retailing at $79.90 the Princess Twilight Sparkle’s Friendship Rainbow Kingdom has a rainbow slide attached to one end of the castle where you can let the ponies zip down in a cloud car. There are also two chest which reveal “secret” items once they are opened with their special keys. There is a love seat at the other end of the Rainbow Kingdom playset where the ponies can swing on. Tiger girl tried putting her ponies on it to let them enjoy the swing but they kept on falling off the seat is not really suited for the ponies. Spike was the only creature which could fit on it nicely and didn’t fall off when the swing was in motion. 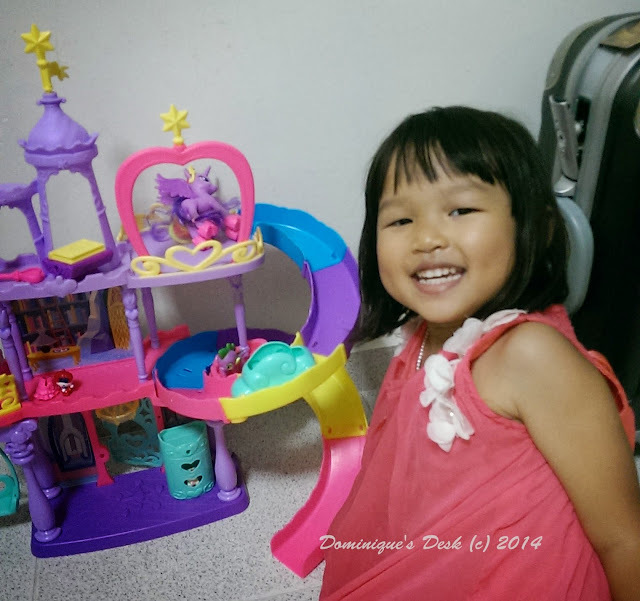 Tiger girl loves the brightly coloured playset and can play for hours with it together with the Canterlot Castle she has. 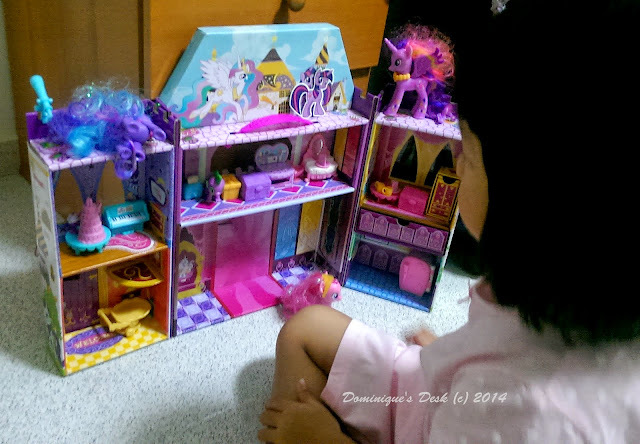 The ponies move from one castle to another as she creates her own stories while playing. Princess Twilight Sparkle, Princess Luna, Pinkie Pie and Spike (The little dragon) go on different adventures together. They sometimes get into squabbles with each other as they vie to go down the slide or go through the different rooms in the castle/ kingdom playset. The playsets make excellent props for creative story telling and stimulating her mind. She can be as imaginative as she wants and is able to create any scenario that she desires. Tiger girl is not only indulging in play but at the same time developing her speech and vocabulary simultaneously. I remember watching the My Little Pony as an animated TV series when I was a kid. I’m glad that my little girl is enjoying the fourth generation of these series of toys by Hasbro. My Little Pony toys too? 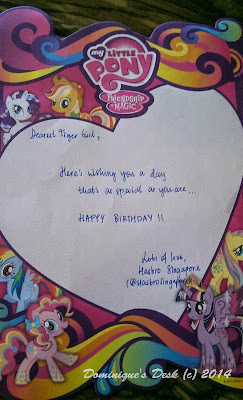 Disclaimer: Tiger girl received the Princess Twilight Sparkle’s Friendship Rainbow Kingdom from Hasbro as a birthday gift. She was also gifted the Canterlot Castle by her brother’s as a birthday present. All opinions are 100% mine. She looks happy with her new toys. wow! that was a really nice gift and she looks so lovely on these photos. Happy birthday sweetie! Ohhh. How I miss being a kid because of this colorful toy sets!